Spinal cord stimulation is regarded as a safe, effective, and reversible option for the management of chronic pain that has not responded to first-line interventions, such as medication or steroid injections. Chronic pain is a common condition experienced by many individuals during their lifetime. Lifetime prevalence rates of chronic pain conditions in the United States have been estimated to be as high as 30%. In fact, the Institute of Medicine has estimated that approximately 116 million people in the U.S. suffer from a chronic pain condition. Indeed, chronic pain is a worldwide problem. In 2006, 15 European countries were surveyed regarding their experience of chronic pain. Of the adults in the study, 19% of them were reported to have suffered from symptoms of pain lasting for more than six months. Further, this study revealed that over half of the individuals reporting having experienced a chronic pain condition were unable to work as a result of the pain. Moreover, almost 20% of those individuals indicated that they had lost their job as a result of their pain condition. Perhaps the most surprising findings from this study were that close to half of the individuals reporting having experienced symptoms of pain persisting for longer than six months were not receiving adequate care for the management of their pain episode, and only about 2% of them were actually being seen by a physician specializing in pain management. Spinal cord stimulation is one form of pain management that has been shown to be effective in treating cases of intractable pain, particularly neuropathic pain. Neuropathic pain can involve either the peripheral or the central nervous system, and is believed to be caused by a lesion or other dysfunction within one of these systems. Spinal cord stimulation is an intervention that involves implanting a medical device near the spine. This device is designed to deliver low-level electrical impulses (which are also the basis of nervous system signaling) to the epidural space, near the spinal cord. Typically, these devices include a hand-held controller that sends these pain-blocking impulses as needed. The goal of this treatment method is to override the pain response system by blocking the signals of pain sent to the brain from the peripheral nervous system. Pain originating from spinal nerves is often associated with abnormal impulses sent through the peripheral nerves as a result of nerve damage through injury or inflammation. Spinal cord stimulation acts to correct these impulses, and thereby effectively controls symptoms of pain. The origin of neurostimulation for the treatment of chronic pain arose following the emergence of the gate control theory. Originally proposed by Melzack and Wall in 1965, the gate control theory suggested that the dorsal horn of the spinal cord acted as a “gate” to sensation stimuli carried toward the spinal cord by the peripheral nerves. It was believed that signals of pain, which were carried to the spinal cord by the peripheral nervous system, could be interrupted by neurostimulation. Thus, it was postulated that implanting a stimulator device onto the dorsal column that would deliver electrical stimulation to the area would disrupt this pain sensation system. Indeed, in 1971, epidural spinal cord stimulation was first utilized successfully to treat a case of intractable pain. Though it was originally developed on the foundation of the gate theory, the mechanisms of action for spinal cord stimulation’s analgesic properties are not fully known. There is a small body of literature that has attempted to explore this theory; however, their findings are inconclusive. It is likely that many factors acting in concert with one another can explain the pain relieving benefits of spinal cord stimulation on cases on intractable pain. Since its development in the 1960s and early 1970s, spinal cord stimulation has undergone much advancement, which has improved the procedure’s efficacy when it comes to reducing and relieving neuropathic pain. For instance, during the original spinal cord stimulation implantation procedure, electrodes were placed in the subarachnoid space (i.e., the space between the protective arachnoid and the pia mater membranes, also known at the meninges, surrounding the spinal cord). In the early 1970s, however, new developments in electrode placement made it possible for electrodes to be placed within the epidural space, which is the space outside of the protective membranes surrounding the spinal cord. This new method for lead placement has led to reductions in certain risks involved in spinal cord stimulation, such as leakage of cerebrospinal fluid or inflammation of the meninges. Currently, there are two types of electrodes available for spinal cord stimulation device implantation, percutaneous and surgical. Spinal cord stimulation procedure is generally regarded as a safe, effective, and reversible treatment option for cases of neuropathic pain. Previous studies examining the effectiveness of the procedure found that, in a one-year follow-up, over 70% of patients who underwent spinal cord stimulation reported ongoing benefits from the procedure. It is estimated that 14,000 spinal cord stimulation devices are implanted annually for chronic pain patients worldwide. Spinal cord stimulation involves the use of electrodes specifically designed for safe and effective implantation into the area near the spinal cord. The procedure itself involves placement of electrodes, along with a stimulation device. There are two types of spinal cord stimulator devices: transcutaneous and fully implantable. In terms of the transcutaneous spinal cord stimulator, the device is implanted subcutaneously (i.e., just beneath the surface of the skin). It is connected to an electrode that is positioned near the spinal cord. The transcutaneous device is the oldest spinal cord stimulation device still being used today. In fact, the transcutaneous device is preferred when high stimulation currents are required. Fully implantable pulse generators operate primarily off of battery power and are programed using an external device. Given this, it is necessary to replace the batteries in the fully implantable devices every two to five years. Patients report that they prefer the fully implantable device, to the transcutaneous device, because the device itself and the coil are not readily detected. Moreover, some patients have had difficulty with correct positioning of the transmitter coil (necessary for transmitting power to the implanted device and to transport pulse data) over the implanted device. The two types of electrodes currently used in spinal cord stimulation placement are either the percutaneous electrode or the surgical plate electrode. The percutaneous electrodes are cylindrically shaped, approximately 1.3 mm in diameter, and have four to eight thin platinum rings (generally about 3 mm long) mounted near the end. The surgical plate electrodes used in spinal cord stimulation placement also contain four to eight platinum contacts mounted to one side and are paddle-like in shape. Though the sizing of these platinum contacts has varied over time, the plate itself generally spans about 8 mm wide. These electrode tips are connected to thin wires (usually about 1.3 mm in diameter) of a soft, flexible material, so that the risk of tissue damage from their placement is minimal. It is generally regarded as common practice for physicians prescribing spinal cord stimulation to implant a trial stimulator to assess whether the patient reports that their pain levels have responded to the treatment. During this trial period, the device may remain implanted from several days and up to a couple of weeks in order for the patient to test whether or not they achieve pain relief from the procedure. During this time, the device is also connected to a programmable pulse generator that examines whether or not the patient experiences any unwanted sensations, such as paresthesia, and if the patient is able to gain significant relief from their symptoms of chronic pain. If this trial stimulator does indeed produce a positive response, then a more permanent device may be implanted. During the spinal cord stimulation procedure a local anaesthesia is used and the percutaneous electrodes are placed within the dorsal epidural space from the medial surface, or the surface area that faces toward the midline. Proper placement is ensured by the use of an X-ray, or fluoroscope, using a cannula. The surgical plate electrodes are more difficult to insert. These paddle-like electrodes are typically placed using general anaesthesia, and require insertion into the dorsal epidural space using a minimally invasive surgical procedure called a laminectomy. The electrodes of spinal cord stimulation devices are generally placed along the spinal cord in accordance with the patient’s reported location of pain. Electrodes are inserted into the epidural space, which is the space that lies just outside of the protective membranes, or meninges, surrounding the spinal cord, and the location is then verified for patient-reported pain relief through a trial screening. Also during this screening, the physician will set the amplitude of the voltage in order to establish thresholds for the patient’s perception of the stimulation pulses and discomfort levels. Along with electrode placement, the spinal cord stimulation implantation procedure involves placement of a pulse generator. New developments in technology have now included the availability of rechargeable devices that patients may decide is right for them. These devices generally require that the patient spend approximately two hours a week charging their devices, while not interrupting the treatment. The pulse-generating device is generally inserted just under the skin either in the lower abdominal region or the posterior gluteal region. This ensures that patients are able to have access to the device for recharging or in case they need to make adjustments to the settings using the remote control. The spinal cord stimulation device is typically connected to a hand-held controller by wires. This hand-held controller is available to the patient and can be used to activate the pain-blocking stimulus as needed. There are a number of conditions that can benefit from spinal cord stimulation. A physician must ensure a full and complete assessment of the patient’s course of pain and treatment attempts prior to recommending spinal cord stimulation. These assessments typically include a brief, yet detailed history of the symptoms, treatments utilized, family history, and other relevant information, which is gathered by your physician. Patients may be given questionnaires to complete regarding their pain condition, and diagnosis is generally made by the clinical judgment of the physician. Thus, it is imperative that patients track and report their symptoms and other information as accurately as possible. This information will assist the physician in determining the most appropriate treatment, as well as in determining placement of electrodes during the device placement procedure, should the patient be an appropriate candidate for spinal cord stimulation. Chronic pain can be quite debilitating and, if left untreated, is expected to have numerous detrimental impacts on the individual’s functioning both at home and at work. Individuals with chronic pain are more likely to miss work, exhibit lower productivity while at work, and have a higher incidence of healthcare visits. Indeed, chronic pain has been linked with other distressing conditions. More specifically, individuals with chronic pain are at risk for developing problems with regard to anxiety and depression, as well as have difficulties with falling asleep or staying asleep. This may be due to the side effects of pain medication or the pain itself making it difficult for the patient to get a restful night’s sleep. Symptoms of persistent pain can make it more likely for an individual to become increasingly sedentary. Individuals suffering from chronic pain are expected to decrease their level of physical activity. This can have other detrimental effects, such as risk of weight gain and exacerbating their pain condition. Chronic pain conditions owing to the spinal nerves, such as stenosis or inflammation, can often be treated with spinal cord stimulation. Stenosis of the spine is a condition characterized by a restriction of the spinal canal and compression of the spinal cord, which is caused by a narrowing of the spinal column due to either postural or spinal abnormalities, or scar tissue that has formed around the nerve. Symptoms of this condition include pain, numbness, paraesthesia, and loss of motor control. Individuals with spinal stenosis may also have difficulty walking. Though there are several types of spinal stenosis, lumbar stenosis and cervical stenosis are the two most common. This condition is often first treated with anesthetic injections. These injections are administered through the skin to the appropriate location (e.g., epidural spaces or cervical joint spaces) in the vertebrae in order to reduce pain. Examples of these are medial branch blocks. These forms of injections produce a significant amount of pain relief in most cases of chronic pain, and the pain relief is experienced almost immediately. However, in cases of severe or chronic pain, spinal injections may fail to produce these results. In these cases, spinal cord stimulation may be the next step for patients to achieve relief from their pain. Some patients suffer from symptoms of chronic pain as the result of back surgery. These cases are recognized as failed back surgery, as the goal of the original surgery was to provide the patient with relief from chronic pain. In these instances, the chronic pain experienced following the surgery is believed to be the result of scar tissue developing around the spinal nerves of the epidural space. Other factors that likely explain pain that persists following back surgery include disc herniation, post-operative pressure that is persistently placed on the spinal nerve, and altered joint mobility. Individuals with a history of anxiety, depression, or difficulty falling asleep or staying asleep are considered to be at an increased risk for developing a chronic pain condition following back surgery. Symptoms of chronic pain that occurred as a result of failed back surgery primarily include diffused, dull, and aching pain across the back and lower limbs. Additionally, some patients may experience sharp, pricking, or stabbing pain in the limbs. Provided that other treatments have failed at providing the individual with relief from pain, failed back surgery patients may be considered for treatment using spinal cord stimulation. Degenerative disc syndrome is a commonly misunderstood chronic pain condition, believed to be the result of wear and tear on the intervertebral discs within the spine. More specifically, with age the intervertebral discs of the spine can wear down, causing them to become inflamed and irritated. This then leads to pain that is typically felt within the back and neck. The pain associated with degenerative disc syndrome can occur throughout the length of the spine; however, in some cases the pain is localized to the area of the affected intervertebral disc. Further, symptoms of pain have been reported, by a number of patients, to worsen with movement. Indeed, the specific symptoms of pain vary between individuals, but generally include either a highly specific sharp stabbing pain or a more general and widespread pain. Other symptoms commonly associated with degenerative disc syndrome include numbness or tingling sensations. Many treatment options are available. Patients whose pain has not responded to these alternate methods of pain management may be considered ideal cases for spinal cord stimulation. Peripheral neuropathy (i.e., damage or degeneration of the nerves within the peripheral nervous system), radiculitis (i.e., pain that has radiated along the sensory nerve as a result of irritating or inflammation of the nerve root), and complex regional pain syndrome (i.e., pain in the upper and lower limbs that is thought to occur as the result of an injury or condition causing dysfunction in the peripheral and central nervous systems), are chronic pain conditions that involve the central and peripheral nervous systems. These syndromes can also be accompanied by symptoms of motor deficits; sensory problems; cramping; fasciculations (i.e., fine motor twitching); loss of muscle tone; bone degeneration; and changes in hair, skin, and nails. Similar to other neuropathic pain conditions, patients suffering from chronic pain related to these syndromes who have not responded to other treatments may be appropriate candidates for spinal cord stimulation. Phantom limb pain: Phantom limb pain is a neuropathic pain condition that generally occurs following amputation. It was once believed that this condition was purely psychological in nature, however, scientists now recognize that the condition likely originates within the spinal cord and brain. While there is no specific treatment that has been supported to treat phantom limb pain, there has been some suggestion that since the pain associated with this condition likely originates within the spinal cord and brain, patients with this condition are expected to experience a significant reduction in pain with spinal cord stimulation. Central pain syndrome: Central pain syndrome is a neuropathic pain condition that results from damage or degeneration of the central nervous system. The specific symptoms of pain differ depending on the injury sustained by the patient. Further, the most common symptom is of a burning pain. Patients may also experience sensitivity to touch, movement, emotions, or temperature changes; the sensation of pins and needles, pressure, aching pain, bursts of pain, or even unremitting, excruciating pain. In some cases, patients have reported that the pain has spread to the degree that the patient feels the pain from the head all the way down to their toes. Given the association to the spinal cord, it is expected that patients with central pain would benefit from spinal cord stimulation. Diabetic neuropathy: Diabetic neuropathy occurs when nerve fibers throughout the body are damaged owing to exposure to high blood sugar. The nerves most at risk for damage are those within the legs and feet. Symptoms include pain and numbness within the limbs, reduced ability to feel changes in temperature, tingling or burning sensations, sharp and jabbing pain (which could be worse at night), pain while walking, trouble walking, extreme sensitivity to touch, muscle weakness, and serious foot problems (including ulcers, infections, deformities, and bone or joint pain). Individuals with this condition are strongly encouraged to maintain appropriate blood sugar levels in order to slow the progression of this condition. There is no known cure for diabetic neuropathy, thus, treatment must focus on pain management. Individuals with this condition have reported benefits following implantation of a spinal cord stimulator. Post-herpetic neuralgia: Post-herpetic neuralgia is another form of neuropathic pain that affects many different areas of the body. This condition is believed to be a complication of the virus that causes shingles or chickenpox. In general, symptoms related to this condition occur within the area where the original virus outbreak began; however, in some cases, the pain may spread to other parts of the body as well. The symptoms associated with post-herpetic neuralgia include acute or chronic pain and extreme sensitivity to touch. Patients with this condition may be appropriate candidates for spinal cord stimulation for relieving the distressing symptoms associated with chronic pain. Spinal cord stimulation achieves positive results in pain management in up to 75% of patients. Some reports show potential for spinal cord stimulation as a treatment for pain associated with several types of cancer. Spinal cord stimulation can provide patients suffering from chronic pain a number of benefits, with relatively few side effects. As with many medical procedures the efficacy of the treatment is based on a number of factors. Factors such as the physician’s level of expertise and amount of training are important considerations. Patients are encouraged to research their physician prior to their initial visit. Patients should only consider practitioners with expertise in pain management, as well as appropriate training to perform spinal cord stimulation. Factors related to the patient’s specific pain episode also play an important role in determining the effectiveness of the intervention. Thus, the patients reported duration of symptoms or even the underlying cause of the pain episode can impact the degree of effectiveness of spinal cord stimulation. The primary goal of spinal cord stimulation is to provide patients with significant relief from chronic pain. Indeed, spinal cord stimulation is not intended to treat the underlying cause of the symptoms. For many, spinal cord stimulation can provide relief from chronic pain that has not responded to other traditional forms of treatment. Additionally, patients are afforded drastic improvements in their quality of life following the spinal cord stimulation procedure. Given that they are able to gain a sense of control over their symptoms, they are able to return to activities that they were involved in prior to the onset of symptoms. Thus, a major benefit of spinal cord stimulation is not only relief from pain, but patients experience a reduced level of impairment. This includes any accompanying disability. For instance, patients who have had to take a leave of absence from their job owing to their pain may be able to return to work following a successful spinal cord stimulation procedure. For patients who have had to leave work owing to disability related to their pain likely have also experienced symptoms of anxiety and depression. Thus, returning to usual activities may also include improvements in the patient’s degree of associated distress. These patients may experience fewer difficulties with anxiety and depression that have likely exacerbated the patient’s pain condition. Though the device itself does require surgery for implantation, this procedure is minimally invasive and can be conducted on an outpatient basis. Further, a trial test can be conducted to ensure that the patient will benefit from the implantation of the device and that their pain condition will respond favorably to spinal cord stimulation. This will also ensure that the patient will not experience any negative side effects associated with the procedure. Patients with spinal cord stimulation devices are able to participate in recreational activities, exercise, or even swim just as they usually would, since the leads are placed just under the surface of the skin. Further, the device can also be easily removed. For instance, if the device is no longer effective or the pain condition has resolved, it is easily removed. In previous studies, the cost effectiveness of spinal cord stimulation was examined in order to determine whether this procedure was an appropriate alternative to other methods of treatment for chronic pain conditions. This study examined spinal cord stimulation in a population of patients suffering from chronic back pain as the result of failed back surgery. Results indicated that spinal cord stimulation resulted in almost $10,000 less in average annual cost over the course of five years when compared to the control group. Further, while no patients in the control group returned to work following the onset of their pain condition, 15% of those who received spinal cord stimulation were able to return to work. Spinal cord stimulation is generally regarded as safe for many individuals. Thus, there are very few contraindications for the procedure. Spinal cord stimulation is not recommended for patients who may be pregnant or who may become pregnant, as the safety of the procedure has not been clinically tested on this population. Long-term effects of spinal cord stimulation also are not as clear. Some patients have experienced long-term benefits and relief from their distressing symptoms of chronic pain as a result of spinal cord stimulation implantation, while others have not. Given that the procedure for spinal cord stimulation is safe and can be done on an outpatient basis, patients who did not enjoy long-term relief from their pain or experience adverse side effects as a result of the intervention are able to have the device removed quite easily. Spinal cord stimulation is generally regarded as a safe and beneficial treatment for most chronic pain conditions. There are very few risks associated with spinal cord stimulation. In fact, serious complications associated with the procedures are quite rare. Spinal cord stimulation may not provide pain relief for all cases of chronic pain. Indeed, previous literature has suggested that about half of all individuals who undergo a trial spinal cord stimulation procedure report gaining significant pain relief from the procedure. Spinal cord stimulation is intended only to provide relief from the distressing symptoms of chronic pain. It is not intended to address the underlying causes of the condition. Patients are encouraged to undergo a full assessment with their physician to ensure that spinal cord stimulation is right for them. The spinal cord stimulation device may fail if it does not cover enough of the area controlled by the defective nerves. It may in some cases fail if the electrical signals produce impulses other than pain blocking, which can cause lack of sensation or nerve damage. Patients who have undergone spinal cord stimulation placement should not undergo diathermy procedures (i.e., shortwave diathermy, microwave, or therapeutic ultrasound diathermy) while the device is implanted. These procedures can cause significant tissue damage and may even lead to death, as the energy from them can be transferred through the device. Other electromagnetic interference, including magnetic resonance imaging, radiofrequency ablation, defibrillation, or electrocautery, should also be avoided by individuals who have had a spinal cord stimulator device placed due to serious risk of injury or death. The appropriateness of spinal cord stimulation has not been examined in patients under the age of 18. Thus, the safety and efficacy of this procedure in pediatric populations is currently unknown. More research is needed in this area, as well as the appropriateness of this procedure in women who are pregnant. Chronic pain conditions are common and are considered a serious public health concern. Unlike the acute pain typically associated with injury, chronic pain is characterized as persistent and unremitting pain that continues beyond the typical time expected for healing. While there is some disagreement within the literature, pain that persists for six months or more is generally regarded as chronic in nature. Lifetime prevalence rates of chronic pain have estimated that as much as 30% of the world’s population will experience a chronic pain condition within their lifetime. Moreover, chronic pain is associated with a number of negative impacts on the individual’s daily functioning both at home and at work. Chronic pain has been associated with missed work, loss in productivity, and increases in sedentary lifestyles. There are a number of treatments available to provide patients with relief from chronic pain. Following an accurate diagnosis by a physician specializing in pain conditions, it is generally recommended that patients first attempt the more conservative forms of treatment for their symptoms of pain. While there is evidence that these treatments are beneficial to a wide variety of pain conditions, there are a number of individuals whose pain does not respond to treatment. For these individuals with intractable pain, more aggressive and long-terms forms of treatment are available to combat their debilitating symptoms. More specifically, spinal cord stimulation is believed to provide relief to individuals with unremitting chronic pain. Spinal cord stimulation has been shown to be particularly effective in cases of neuropathic pain. Specifically, spinal cord stimulation involves the use of a medical device that is implanted near the spine to deliver low-level, pain-blocking electrical impulses. These impulses are believed to block pain signals from the peripheral nerves. Thus, spinal cord stimulation acts to control pain signals from spinal nerves that are damaged or inflamed. 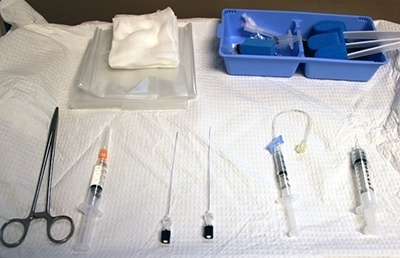 The implanted device is often connected to an interface device, so the patient maintains control and is able to activate the stimulation when necessary. Though spinal cord stimulation is more invasive than other procedures, such as nerve-blocking injections, it has been shown to be much more effective over a longer period of time for treating intractable pain. Further, this procedure is generally regarded as safe. Though it does involve a surgical procedure, this can be done on an outpatient basis. Patients who are regarded as good candidates for receiving spinal cord stimulation can expect to undergo a trial period. During this time (usually several days to a couple weeks), the patient will be equipped with a temporary device that will monitor the patient’s response to the intervention. Should the patient report no unwanted side effects along with relief from pain, then they may have a more permanent device implanted. The spinal cord stimulation device is easily removed should the patient no longer need it for pain relief or the device malfunctions. Though few studies exist examining the mechanisms of action underlying spinal cord stimulation, evidence is mounting regarding its effectiveness for a wide range of pain conditions that failed to respond to first-line interventions. Additionally, there is some data emerging regarding the use of spinal cord stimulation in the treatment of patients with Parkinson’s disease. Improvements to the system and its procedure are impending, given the significant advances in technology. Thus, spinal cord stimulation may emerge in future studies as an ideal method of treating chronic pain. Deer TR, Skaribas IM, Haider N, et al. Effectiveness of Cervical Spinal Cord Stimulation for the Management of Chronic Pain. J International Neuromodulation Soc. 2013. 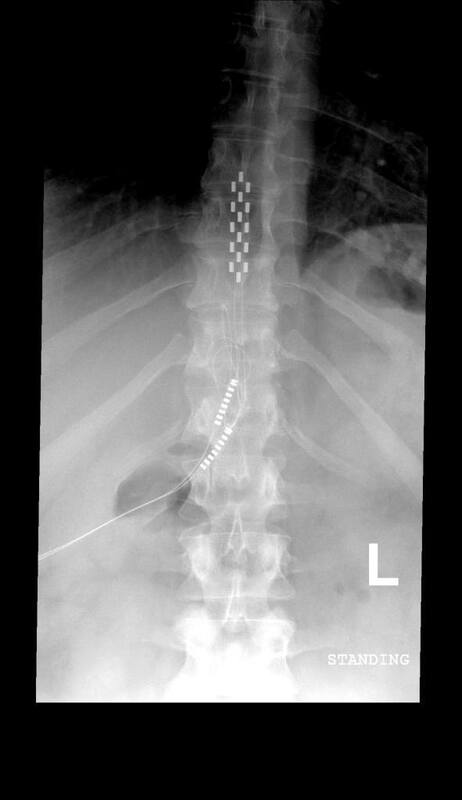 Logé D, Vanneste S, Vancamp T, Rijaert D. Long-term outcomes of spinal cord stimulation with percutaneously introduced paddle leads in the treatment of failed back surgery syndrome and lumboischialgia. Neuromodulation. 2013; doi:10.1111/ner.12012. Rigoard P, Desai MJ, North RB, et al. Spinal cord stimulation for predominant low back pain in failed back surgery syndrome: study protocol for an international multicenter randomized controlled trial (PROMISE study). Trials. 2013;14(1):376.